Halloween maybe thought by some to be a fun event with dressing up and sweets but there is a sinister side to this day. Halloween is a celebration observed in a number of countries on 31 October, the eve of the Western Christian feast of All Hallows’ Day. In the ancient Celtic festival of Samhain, people would light bonfires and wear costumes to ward off ghosts. The Celts, who lived 2,000 years ago in the area that is now Ireland, the United Kingdom and northern France, celebrated their new year on November 1. In the eighth century, Pope Gregory III designated November 1 as a time to honor all saints. 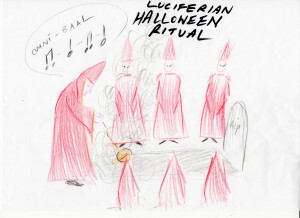 Soon All Saints Day incorporated some of the traditions of Samhain. The evening before was known as All Hallows Eve, and later Halloween. Over time, Halloween evolved into a day of activities like trick-or-treating, carving jack-o-lanterns, festive gatherings, donning costumes and eating sweet treats. The Celtic festival may indeed derive from even further back in time to the Egpytians or even the Sumerians. Nowadays it is seen as a commercial event. One quarter of all the candy sold annually in the U.S. is purchased for Halloween. 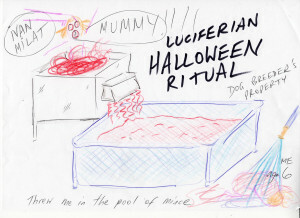 However for the Luciferians, Satanists, Illuminati who carry out ritual sexual abuse, this is a time to indulge in their disgusting nefarious practices which include abusing children in their rituals. Luciferians, Satanists and Illuminati are unfortunately in positions of power all over the world, and there are many of them. Illuminati alone in the US being about one in a hundred people. 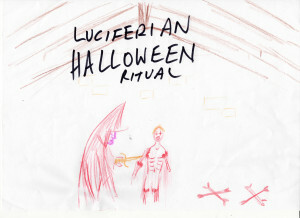 The following is a post from Fiona Barnett and illustrates this ugly side to Halloween.